Born in Castel Umberto on 10.12.1932. 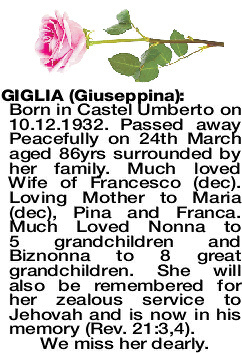 Passed away Peacefully on 24th March aged 86yrs surrounded by her family. Much loved Wife of Francesco (dec). Loving Mother to Maria (dec), Pina and Franca. Much Loved Nonna to 5 grandchildren and Biznonna to 8 great grandchildren. She will also be remembered for her zealous service to Jehovah and is now in his memory (Rev. 21:3,4).